The “Water of the Gods” SPA is an ideal place in which to regenerate and recover your energy and vitality. 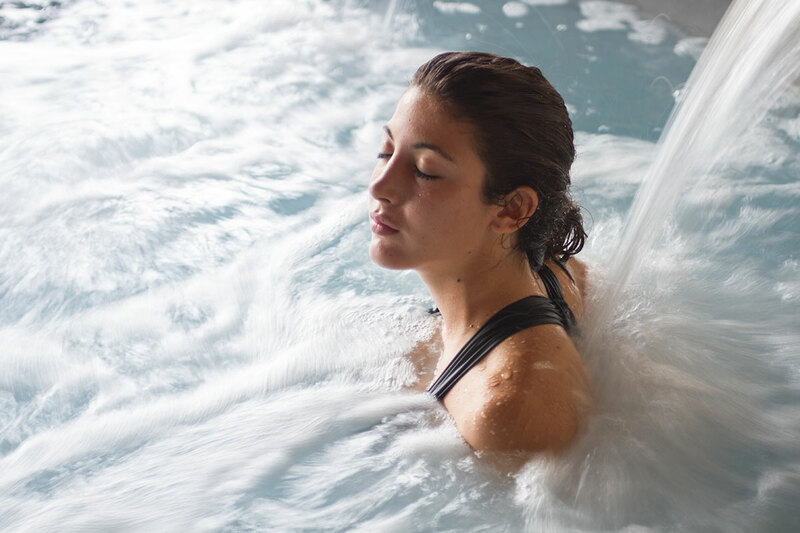 Its cascading waters, hydromassages, steam baths and warmth lead you to wellbeing: the relaxing and toning properties stimulate metabolism and alleviate stress. This large pool faces the garden and has a number of hydromassage seats. Cascades and water jets are the first stop on your spa itinerary and your first emotion. The water, at a pleasant 34°C, will envelop you and transport you to our world of wellbeing. The Calidarium is a purifying steam bath in which your body temperature increases, reactivating your circulation. It detoxifies and re-energizes. The Finnish sauna, or Dry sauna, has a temperature of about 85°C and very low humidity. It beneficially accelerates your metabolism, helping to alleviate stress and improve blood circulation. This is an ambient temperature spring in which to refresh yourself after the Calidarium or Sauna. Besides its vasoconstrictive and toning properties, it offers a moment of absolute wellbeing. In the ancient Terme Bagni Freddi, once located next to our Hotel, the thermal waters surfaced naturally and filled basins excavated in the travertine bedrock; for this reason they were called Bollori. To recall this tradition, we created three hot tubs set in the floor of our spa and gave them the same name: I Bollori. Temperature 35°C. This is a welcoming area for silent relaxation. Here you can appreciate the regenerating power of the absence of noise and external stimulus. Your only duty is to take time out for yourself. On Tuesdays it opens at 10am. Children accompanied by an adult are welcome at the Aqvadei Spa 9am-12:30pm and 2.30pm-5pm. Please note that their fun must be respectful of others or they will be asked to leave. Our wellness centre offers you treatments from different cultures of wellbeing: all make use of our natural cosmetic products. Knowing, expert hands, professionalism and courtesy will guide you to complete physical and mental relaxation. The saltwater pool, set in a veranda constructed in stone, wood and terracotta bricks, faces the aromatic garden. This is a private area in which the sound of water dominates; unless accessed to relax between one treatment and the next, booking is required. The tradition of ancient Roman baths, featuring a tepidarium, calidarium, and frigidarium, has evolved thanks to the Arab Hammam: ablutions, both aesthetic and therapeutic, are performed in the presence of steam and accompanied by the relaxing sound of water. Deep skin peeling for the body and mind, revitalizing and relaxing. Rasul is a traditional Arabian cleansing ritual to purify the body through a combination of four elements: water, fire, earth and air. Our Rasul combines the warmth of the Hammam, thermal muds from Rapolano, water and the aroma of orange oil. Vitis vinifera, Tuscany’s most important plant and fruit, forms the basis for this group of treatments. Pleasantly perfumed and relaxing, your skin will benefit from the grapevine’s antioxidant and anti-aging properties: you will discover grape marc baths, massages and facial treatments. Milk baths form the basis of an ancient tradition of personal care. From Roman patricians to the most beautiful women in history, milk is synonymous with youthful, velvet-soft skin. Our creamy milk baths and face and body treatments will contribute to your wellbeing. Rediscover this ancient practice. Both the Wellness Centre and the Saltwater Swimming Pool are off-limits to children. Professional, expert hands and our AQVADEI products containing natural active ingredients: these are at the core of all our treatments. We have put all our passion and expertise into carefully designing services that will bestow wellbeing, relaxation and lasting effects. Three pools of differing complementary properties create an itinerary in which body and water come together to allow the mind to relax. A one-of-a-kind pool containing sea salt: facing the aromatic garden, this is a secluded area in which the sound of water dominates. Located in the gardens surrounding our Hotel and framed by lush green vegetation, this is an ideal place in which to bask in the sun and bathe in the refreshing waters throughout the summer period. This unheated freshwater pool is open from Easter to October. Located within the SPA area, it faces the gardens leading to the outside swimming pool. The pool, with a mean temperature of 34°C, has many jets of water and cascades. 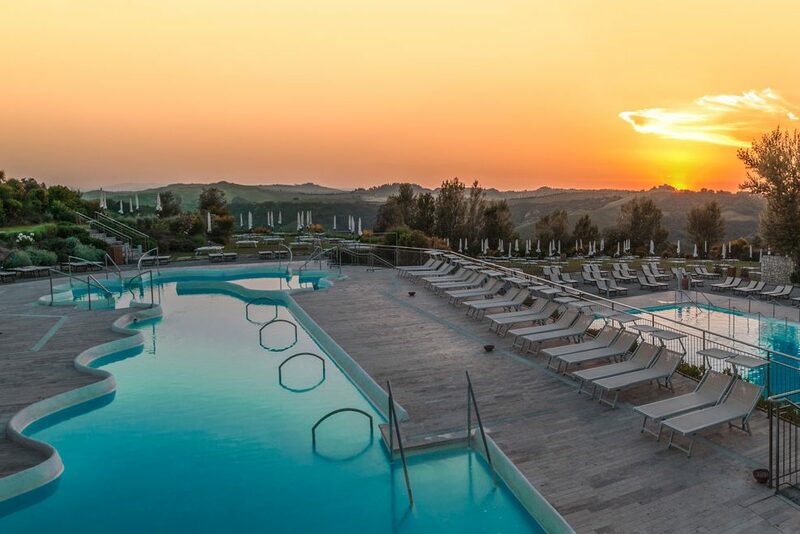 Based on our territory and its peculiarities, we decided to expand our offer through an agreement with the Terme di San Giovanni di Rapolano. Our guests will be able to enjoy their Thermal Pools Park, not far from our Hotel, for a very convenient price. The Parco Piscine di San Giovanni has a calcium-magnesium bicarbonate thermal water. Two outdoor and one indoor pools are reserved for external guests.